One of the sometimes overlooked methods to increase horsepower, torque and even improve fuel economy is vehicle tuning. This is also commonly referred to as re-programming the ECU. What this entails is uploading a new program into your vehicle’s computer that changes many control parameters of your car’s electronic control system. These include but are not limited to revising fuel mapping, increasing or retarding ignition timing, and changing shift points to name a few. In most vehicles from the mid 90’s to present day, there is a port found underneath the dashboard on the drivers side that allows access to the vehicle’s onboard computer. Via this port one is able to completely upload new, revised programming into the ECM to either increase horsepower, get better gas mileage, or both. This can be all done without even opening up the hood in most cases. We offer complete tuning for most GM platforms including: Corvette(C5,C6,C7,Z06,ZR1), Camaro (94-95 OBD1, 96-97 OBD2, 98-02, 2010-present, 1LE, Z28 and ZL1), CTSV, GTO, G8, Trans am, Truck, and SUV's just to name a few. 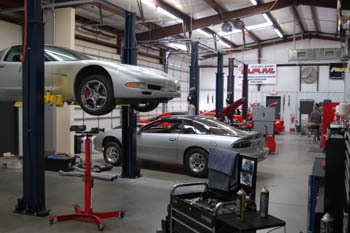 Call or email us with any question regarding any GM vehicle you need re-programmed. We use our in house DynoJet chassis dyno in conjunction with Hptuners, TunerCat, Big Stuff 3, Fast XFI, Holley, Jetflash and others for all your GM tuning needs. We also offer carburetor tunes for GM, Ford, Chrysler and others as well. Our tuning purposes are to get the most power, at the safest level, and with the best drivability possible.